I’ve wanted to make handmade soaps for many months before I actually attempted my first batch. The problem wasn’t that I was too lazy to start, but rather, because the process seemed so complicated and tiring. I just wished someone had told me how simple the process is before I procrastinated for so long! I truly think that soap making is simple. Not easy, but simple. It can be potentially dangerous, yes, because you use a chemical called Sodium Hydroxide, also known as “lye,” which can get extremely hot and can burn your skin when mishandled, but if you pay careful attention just as you would when deep frying food, the entire process can be very safe and hassle free. Basic ingredients of soap are fat (oil) and lye, and you can decide on what kind of fats you need to use and how much, depending on what kind of soap you’re trying to make. For example, for a soap that’s gentle and truly wonderful for you skin, you can use olive oil. If you want a soap that lathers well, coconut oil will do the job. If you like a soap that can hold its shape well, palm oil is your answer. Just like cooking, you can be as creative as you wish when deciding your special “recipe.” I am still learning how to make my own personalized formula (it takes a little planning and a dash of mathematical calculations) so for now, I simply follow several recipes that I find in my favorite soapmaking books. ① First, measure the oil(s) based on your recipe. This particular soap I made called for olive, palm, and coconut oils, so I weighed them separately. ② Melt the oils together in a double boiler. As you can see, some oils are liquid (olive oil) and some are solid (coconut oil). Once the oils melt, bring the temperature down, per your instruction. ③ While the oil mixture is adjusting its temperature, measure the lye according to your instruction. Make sure to wear a pair of gloves when handling these little flakes, as it can irritate, at best, and burn, at worst, your skin upon contact. Make sure to keep anything that contains lye out of reach of children and/or pets! ④ Add distilled water to the measured lye. A strange-smelling gas will fume the second you add the water. Make sure that nearby windows are open for proper ventilation (I do the mixing outside). Stir until all the flakes dissolve, and bring the temperature down to the recipe’s instruction. Drizzle the lye mixture into the oil mixture slowly, and mix with a whisk. The idea here is to combine the oil and lye mixtures when they are at the same temperature. Mix for 30 minutes, or per your instruction. ⑥ When the mixture becomes firm enough that the whisk can “pick up” the custard-like mixture, pour it into a parchment paper-lined mold. Mix essential oils and other additives well, if any, right before pouring. I use wooden molds but you can use anything (some people put two milk cartons together to make a mold and others use Pringle’s tubes). Put the mold in a warm place, like in a box, and put a blanket over it. Keep it stored in the box for about 1-2 days, or per your instruction. After 1-2 days, remove the block from the mold (the block is still relatively soft). Make sure to wear a pair of gloves when handing the soap block, as it can still irritate your skin on contact. Let the block rest for about a day in a dry place, until it’s ready to cut. ⑦ When ready, cut the block into smaller pieces and let them dry and cure for 4-6 weeks, depending on your recipe. I know it takes all the discipline not to use these cute little soaps but be patient. Until the lye completely cures, they can be very harmful. When the soaps completely cure, you’re ready to indulge in your handmade soap! Note that the longer you dry, the harder the soaps become (and they will last longer). Here are the pictures of my latest two batches — Marseilles soaps with Sugar Plum fragrance oil (left), and with Yuzu fragrance oil (right) for the holidays! Here are some online resources with lots of great information and inspiration! These are the soap shops that I adore! Very helpful instructions with all the basics well covered, thanks for that and good luck with you further batches. Thank you for checking out my soap tutorial. Glad the hear that I was able to cover all the basics! I am still new to the soap making world but I am fascinated by every new discovery! I cannot wait to dive into your blog and learn some more! It’s nice to meet you! I thought you should always add the lye gradually to the water and never the other way by adding water to lye, everwhere I read they warn doing that way can result in a volcano like erruption? I’ve read that too, but I’ve never had any issues when adding water to the lye. Actually, I find it to be safer since lye can fly all over the place if you’re not careful. I think it’s your personal preference. I think most of the books written in English do give the instruction to add lye to water, but many of the books from Japan (which is what I used when I first began making soaps) state the other way. I guess it just stuck with me. Luckily, I’ve never experienced the volcano-like eruption! 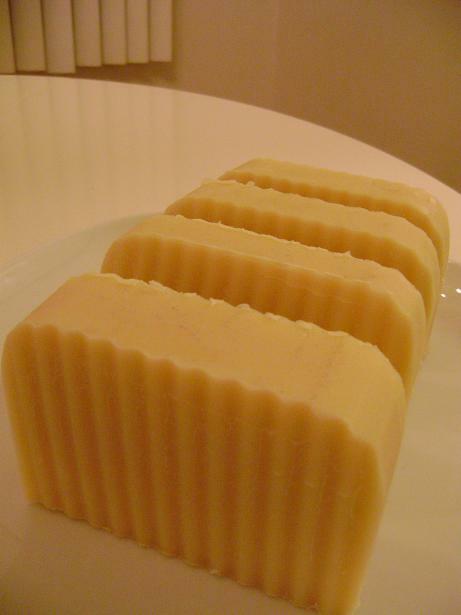 Have you ever made soap with milk or tea instead of water? I would love to hear your comments on that! Thanks! I’ve made soaps with yogurt (and loved them) but not with milk. I hear that milk adds great moisture to the soap! I would love to try it soon! I’ve never done it with tea either, but I’ve used green tea powder for color! I think the scent and the color will be gorgeous with tea, but I’m afraid it might stain because some teas can be super strong! Are you a soap maker? I think your food blog is lovely!